Second of all, I think ugly sweater + brogues= perfect Christmas outfit ever. which means outfit photos will once again be so much easier to take! Goal for the new year: update atleast 3 times a week. and I hope your holiday is truly wonderful! Maybe you should do a closet tour when you get back to london.. I'd love that. Or a whats in your purse kind of thing. 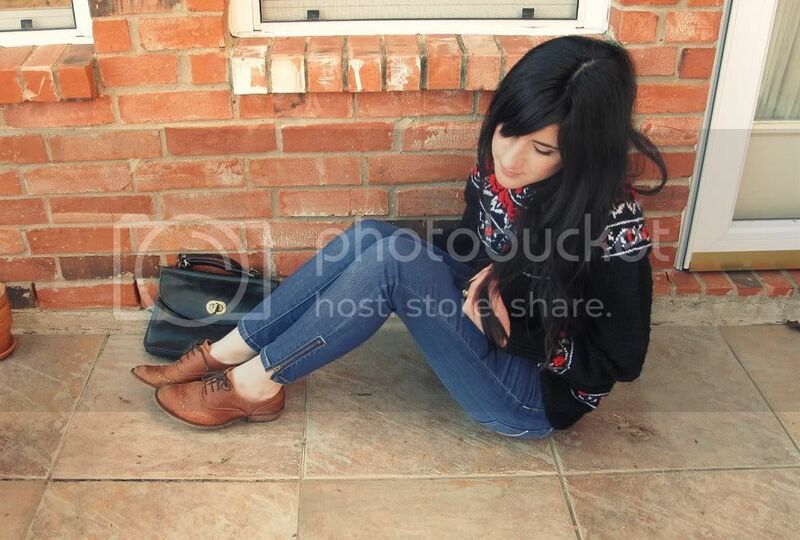 the sweater and oxford shoes are fab! merry christmas and happy holiday! Yep I agree must be the perfect Christmas outfit! I love the blog! You look really beautiful! I've had a lovely Christmas at my grandparents but a bit deactive on the blogging front because I do not have my computer to blog from so I'm just commenting from my iPod! happy holidays! glad u're back:) ur vlog is too cute!! love it:D let's see, as for my question...how many pairs of shoes do you own? :) hope u're enjoying all the festivities! merry xmas! 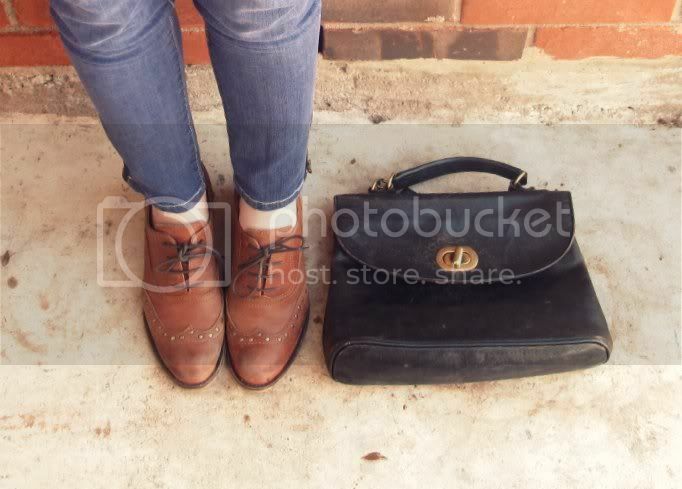 i love the brogues!!! so cute. i love the bag as well. for your next vlog, you should do something like a closet post or a diy. haha, aww- i feel like what happened in your video blog is what would happen to me. actually, my mom barged into my room the other night when i was trying to take some pictures, ha! You use a tripod, right? Are you using a self timer on your camera? or do you have a remote control? I have to use the self timer on mine and it really stinks...i think i may start looking for a replacement camera as mine does not support the ability to work with a remote. And your v-log is so cute, can't wait to see more!! Merry Christmas and happy holidays to you!! ooh! I love that sweater! Its adorable! hahha you're still adorable when making a 15 second appearance=] your eyes looked so pretty in it! and i love the christmas sweater! Ohhhh that is such a cute outfit. =] PERFECTO! What's the weirdest dream you've ever had? Hahaha bonnie you are insane! Love the 5 second video. Reminds me of our video chats. you should include your mom in the next one that would be the best! haha. Anyways, i have a theory that "ugly sweaters" aren't, weren't, and never will be ugly. Evidence right here. Glad you are back! Love the sweater and that video clip was just adorable! this is a really cute outfit ! I perused through your other photos as well and u have a great selection of outfits. love it. Hope you had an amazing Christmas ! Thank you for the comment,dear!You have a great blog,and I'm going to follow ! I'm so happy you're back girl!! Adore the side zipper jeans too. Ohhhh,I surely love your first vlog! Even though it was short but you are so adorable! Can't wait for the next one. I've got questions for your next vlog! hmmm,what is your favorite thing to eat when you were in London? What do you do on a bad hair day? Don't know..next time u could talk about...ur Xmas presents? about the sales?? about London and ur life there? i love your outfit! very christmas-y. cute try on your video blog! snuggly chistmas outfit! you look so cute and comfy! Merry christmas :) I like your sweater (it's not ugly at all)I like to wear big jumpers when the weather is really cold. I have questions ^^... what was your favourite christmas present? which is your favourite city and why? I love the sweater and the oxfords together!! Awesome ugly Christmas sweater. I really want someone to knit me one! Your vlog was hilarious. I love your sweater. Now...a question...when did you first become interested in fashion? Is your family stylish as well? Do you consider your mother a fashion icon/has her style made an impression on yours? i Love your jeans, and shoes so much! ah! 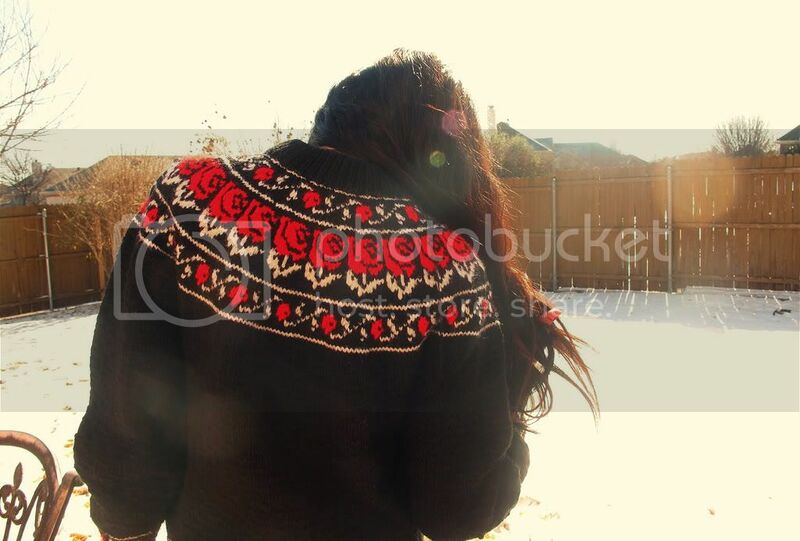 your sweater is the cutest:):) glad to hear youre having a great xmas, cant wait to watch your next vlog! why are you such a trend whore/slave to trends? why are you such a hoe? why don\'t you just give up already? oh and how much do you weigh? adorable outfit! i love your shoes. Love the outfit. maybe you could talk about your trip to London. Btw, are you going back or was it for only a semester? love the vlog - glad youre back! what was your favorite thing about your time abroad? any future/career plans? it must be so nice being in texas during xmas, its not freezing and you dont have to worry about catching pneumonia! you look nice and cozy! love, love, love these photos. great post!! just posted that i love pics of people in the snow haha good one! the outfit is adorable. so envious of the white christmas! must have been fab (: merry christmas! the one in the pictures is perfect for the season yeah!!! Its funny I was just looking at a pair of shoes like this on Aldo, but was hesitant as to how I would wear them. Now I see. Thanks for the idea! Gorgeous outfit, love the little sweater!! Your oxford flats are adorable ! I love your style! And you have beautiful clothes. Your vlog was funny although you din say anything. P.s Could we exchange links? Looove the Xmas outfit and I love the short video blog...haha but yes next time don't let your mom come into your room. Ok my question: How was Italy? What do you think of shopping in London? What do you miss most about home when you're away?